A quality that successful real estate professionals share is community involvement. RE/MAX Associates in particular are mindful of the impact they make locally, not just in real estate but as caring citizens. Over the years, our Associates have distinguished themselves as stewards for the betterment of their communities, concerned not only with contribution to their communities but also with the outcome of the contribution. These qualities - known as RE/MAX Premier Community Citizenship - are a dynamic part of the RE/MAX organization. For example, RE/MAX Associates have always been among the leaders in their communities, devoting time and dollars to countless charities and local causes. Committed to their own personal charities, RE/MAX Associates and offices contribute tens of millions of dollars annually to their respective communities. 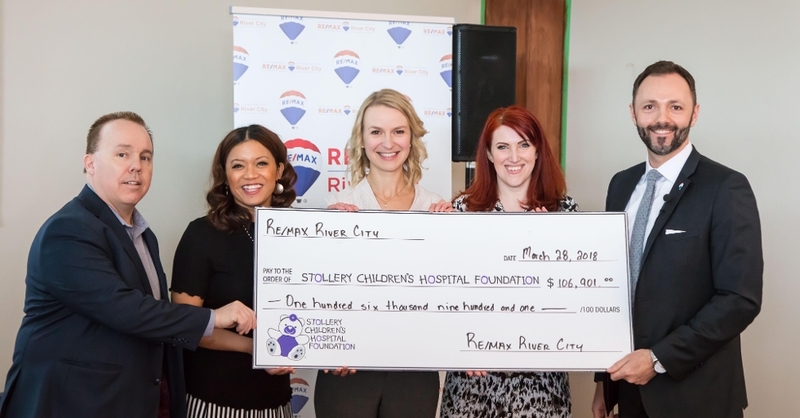 At the network level, RE/MAX sponsorship of the Children's Miracle Network and its affiliated hospitals is a prime example of RE/MAX community citizenship. One of Children's Miracle Network's largest corporate partners, the RE/MAX network in Canada has raised over $64 million for the charity since 1992. The hallmark of Children's Miracle Network is that 100% of every dollar raised in a community stays there to help children in need who are served by participating hospitals in the local area. For further information about the RE/MAX and Children's Miracle Network affiliation please contact Marie Sheppy, Senior Coordinator, Corporate Affairs, at RE/MAX of Western Canada (msheppy@remax.net) or link to www.childrensmiraclenetwork.ca. The Miracle Home® Program, exclusive to RE/MAX International, allows a RE/MAX Associate to donate a portion of every transaction to Children's Miracle Network. The partnership underscores Sales Associates’ involvement in the communities where they live and serve. The cornerstone of RE/MAX´s support of the Children´s Miracle Network is the RE/MAX-CMN MIRACLE HOME Program. It has proven to be one of the most successful cause-marketing programs that CMN has developed with a corporate sponsor. RE/MAX Sales Associates designate listings to be a Miracle Home, and donate a portion from the sale of each home towards the CMN member that serves their area. If you see a RE/MAX lawn sign with a Miracle Home logo on it, know that the sales associate behind the sign believes in giving back to the community they do business in. When listing or purchasing a home, call RE/MAX and request an associate participating in the MIRACLE HOME program! RE/MAX River City has been proud to be the largest contributing RE/MAX office to CMN in Edmonton annually since 2006. We are proud to be called a Miracle Office, meaning we have 100% involvement by all of our REALTORS. As well, RE/MAX of Western Canada created the "Quest for Excellence Program". This bursary program was established to recognize the success and on-going pursuits of Western Canadian students. A "Quest for Excellence" involves any student in Grade 12 who demonstrates great feeling and passion, commitment and dedication, positive attitude and enthusiasm for the subject chosen. RE/MAX presents 24 bursaries of $500 each regionally. The categories are Leadership, Sports, Technology and Trades, Fine Arts, Performing Arts and Community Service. RE/MAX is proud to recognize students, in the very communities in which we live and work, for their outstanding achievements. Education is the building block of our future and if the children we hear from every day are any indication, our future has never been brighter. For further information or to apply for the Quest for Excellence scholarship, contact Marie Sheppy, Senior Coordinator, Corporate Affairs, at RE/MAX of Western Canada (msheppy@remax.net or call 1-800-563-3622). RE/MAX is committed to help raise awareness of the ongoing need for organ donation. Contact us to find out more information on how to register to be an organ donor and for contact information on the provincial organizations that are mandated to oversee organ and tissue donation programs across the country. RE/MAX has a long tradition of supporting worthwhile causes. In 2004, the company threw its support behind the Canadian Breast Cancer Foundation and programs like Edmonton's Cross Cancer Institute, Primary Prevention Research and Breast Care and Health in Ontario. RE/MAX invites you to join the event that brings hundreds of neighbourhoods together for a massive one day yard sale in support of breast cancer. “Yard Sale for the Cure” is the natural evolution of our involvement with breast cancer, and yet another occasion for us to give back to the community. In real estate, it’s often said that you only have one chance to make a good first impression. There is no truer adage when it comes to selling your home. A well maintained and clutter-free home will sell more quickly and for a higher price than a similar home that is not as inviting. “Yard Sale for the Cure” provides homeowners with an excellent opportunity to unload items no longer in use, while simultaneously raising much-needed funds for Breast Cancer Research. Fundraising events such as “Yard Sale for the Cure” ensure we all play a role in finding a cure for breast cancer. Yard Sale For The Cure takes place in May. To find out more about this event, contact your RE/MAX River City Sales Representative. When you register at yardsaleforthecure.com, you will receive a lawn sign. Install this sign on the lawn as far in advance as possible. Spread the word to your friends and neighbours about your sale and the cause it’s supporting. Download the free poster and put it on display. Wear your hat so people know you’re an official host. Tie the pink ribbon where it will be seen from the street. Start accumulating stuff your want to sell as soon as possible. Put in boxes and organize by price categories. Remember one persons trash is another’s treasure! Get organized early, the biggest crowds are often right in the first hour. Put prices on every item if possible. The general rule of thumb is to price items at 1/3 of what it costs new. But be objective and use common sense. The bigger the item the bigger the price tag should be, don’t put a tiny posit-it note on a couch! Tables are a great way to merchandise and display your stuff. Make a pot of coffee and put some background music on, it makes your sale feel more relaxing and people may browse longer. Have lots of coins and small bills to make change. Have plastic grocery bags on hand for people to carry their treasures away. If you have kids, get them involved by having their own table to sell their old toys and books. Yard Sale for the Cure is an organization that raises money for Breast Cancer research and treatment by holding a massive series of Yard Sales in selected neighbourhoods across Canada. In 2005, the inaugural event was held in the Toronto Beaches. It was a huge success, raised $45 000 and brought people together with a great sense of community and purpose. After that a growing number of people from across Canada took on this idea and Yard Sale for the Cure was launched in markets across the country. Yard Sale for the Cure will be widely publicized and advertised in each of the communities, so lots of people will be attracted to shop at your Yard Sale. In fact, in 2006, $3.2 million dollars of PR and over $200 thousand in free media was secured to help promote the one day event.